Isolating pads on data and address lines – Many Z80 designs have resistors placed between the CPU and some peripherals. 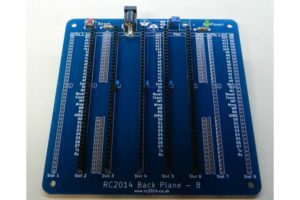 This backplane gives you the flexibility of totally isolating any of the address or data lines, adding resistors or simply soldering links or jumpers across. Slots 1 & 2, slots 3, 4, 5 & 6 and slots 7 & 8 can all be partitioned off if required.